Almog, Orna. “Unlikely Relations: Israel, Romania and the Egyptian–Israeli Peace Accord.” Middle Eastern Studies (early view; online first). The history of Israel’s turbulent relations with the Eastern bloc nations during the Cold War has one exception, Romania. Unlike other Warsaw Pact members, Romania did not sever relations with Israel following the 1967 war. Central to these relations was Romanian Communist leader Nicolai Ceausescu, who managed to establish himself as an important figure among both Arabs and Israelis. This article will examine Romanian–Israeli relations during the 1970s and especially Ceausescu’s role in the Egyptian–Israeli peace negotiations. Recent Israeli and some Romanian documents released from the Israeli State Archive and the Begin Centre reveal much about Israel’s attitude towards Romania and Ceausescu’s involvement in the Middle East, and serve to shed light on a heretofore neglected aspect of Israeli foreign policy. Some of the main issues to be addressed are Ceausescu’s influence on Egyptian and Israeli decision makers, Israel’s prime motives in maintaining a close relationship with Romania, the importance of Romanian Jewry’s position to Israel’s policy vis-à-vis Romania and the extent to which these relations represented a back channel that facilitated some contact with the Kremlin. 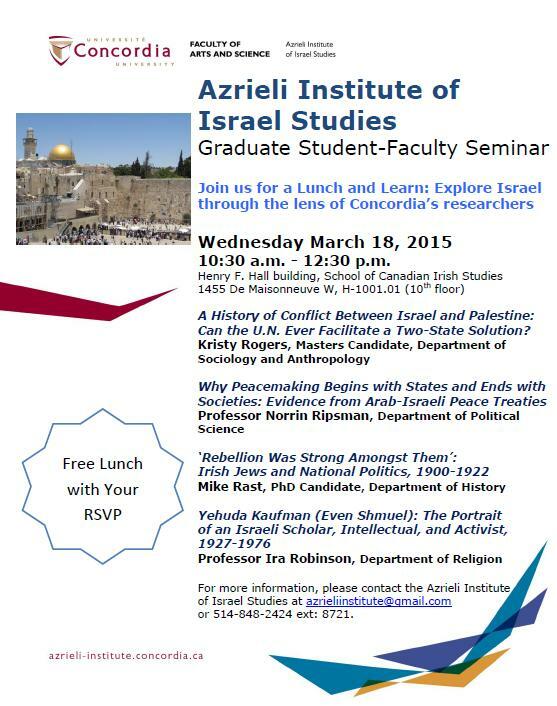 All these will be examined against the larger backdrop of the Cold War and the Arab–Israeli conflict. Diab, Rasha. “From the Egyptian People’s Assembly to the Israeli Knesset: al-Sādāt’s Knesset Address, Ṣulḥ, and Diplomacy.” In Shades of Ṣulḥ. The Rhetorics of Arab-Islamic Reconciliation (Pittsburgh: University of Pittsburgh Press, 2016): 112-60. In late November 1977, Muḥammad Anwar al-Sādāt undertook a risky and highly visible trip across the Egyptian-Israeli border to visit with the Knesset . The epigraph above comes from his Knesset address (hereafter KA) and sums up its overall goal, which sought to enable deliberation commensurate with the gravity of a series of wars and to attain peace. al-Sādāt’s KA interrupted and transformed a prolonged diplomatic stalemate, resuscitated peace talks, and eventually led to the Camp David Treaty. The KA and texts it deliberates with and against are the focal point of this chapter. This chapter offers a bidimensional reading of ṣulḥ discourse, underlining how al-Sādāt’s diplomatic deliberations resuscitated Egyptian-Israeli peace talks in 1977 by drawing on a long tradition of public, formal ṣulḥ in addition to the three main features of ṣulḥ, namely initiating peace through commitment; mobilizing witnesses; and creating a community, political structure included, of peace pursuers. As such, this chapter provides yet another case where the three main features of ṣulḥ are conspicuous. I contend that these features of ṣulḥ are crucial to understanding al-Sādāt’s 1977 peace initiative and that they are the backbone of the address. However, ṣulḥ continues to be invisible in scholarship on al-Sādāt’s initiative. It is important to note that in this case ṣulḥ expresses itself in relation to other discourses that also seek to create transformative encounters, namely diplomatic discourse, border crossing, war/peace epideictic rhetoric, and policy articulations at moments of crises. In this mix, ṣulḥ can be forgotten unless we deliberately tease out its manifestation in both the symbolic and procedural dimensions of peacemaking. Gavriely-Nuri, Dalia. “The Outbreak of Peace in Israeli Children’s Periodicals, 1977–1979.” Journal of Multicultural Discourses (early view; online first). This study focuses on two exceptional moments in the Egyptian–Israeli history of conflict: the visit of President Anwar Sadat to Jerusalem in November 1977 and the signing of the Israeli–Egyptian peace treaty in March 1979. Combining peace studies, cultural studies and discourse analysis, the article analyzes the response of Israeli most popular children’s periodicals to these dramatic peace events in real time, during the months in which they occurred. The article’s contribution to peace research lies in its ability to shed light on how intergenerational discourse conveys peace legacy, a relatively neglected arena in peace research. In doing so, it likewise focuses on the discursive ‘failures’ embedded in the Israeli peace discourse. Gartman, Eric. Return to Zion. The History of Modern Israel. Lincoln: University of Nebraska Press, 2015. The history of modern Israel is a story of ambition, violence, and survival. Return to Zion traces how a scattered and stateless¬ people reconstituted themselves in their traditional homeland, only to face threats by those who, during the many years of the dispersion, had come to regard the land as their home. This is a story of the “ingathering of the exiles” from Europe to an outpost on the fringes of the Ottoman Empire, of courage and perseverance, and of reinvention and tragedy. Eric Gartman focuses on two main themes of modern Israel: reconstitution and survival. Even as new settlers built their state they faced constant challenges from hostile neighbors and divided support from foreign governments, as well as being attacked by larger armies no fewer than three times during the first twenty-five years of Israel’s history. Focusing on a land torn by turmoil, Return to Zion is the story of Israel—the fight for independence through the Israeli Independence War in 1948, the Six-Day War of 1967, and the near-collapse of the Israeli Army during the 1973 Yom Kippur War. Gerdes, Daniel L. The Possibility of Peace: Israeli Public Opinion and the Camp David Accords, Hamline University Departmental Honors Projects, 2015. The Camp David Accords, September 5-17, 1978, were a momentous development in Middle East relations. For over 30 years Israel and her neighbors weathered periods of warfare and aggression, but when leaders from Egypt, Israel, and the United States descended on Camp David in the United States for two weeks of peace negotiations everything changed. Egyptian President Anwar al-Sadat and Israeli Prime Minister Menachem Begin became the first leaders in the Middle East to negotiate peace after decades of war between the two countries. This research discerns the changes in Israeli public opinion on the peace process with Egypt that occurred between the 1973 Yom Kippur War (the last major conflict between Egypt and Israel), and the 1978 Camp David Accords. Understanding these changes helps bring to light new aspects of the peace process that have not received as much scholarly attention in the past—in particular, the changing discussion within Israeli society. This research examines the public debate in Israel prior to the accords, and specifically the role of the press in disseminating commonly held political beliefs of the general Israeli public. This project centers on analyzing articles from four major Israeli newspapers which represent different audiences in Israeli society to shed light on the changing perspectives held by Israelis from 1973 to 1978. Five major events were identified for this period: the 1973 war, the military disengagement after the war, the visit of Sadat to Jerusalem, before the Camp David conference, and after the Camp David Conference. Articles were selected from the various newspapers reflecting public opinion about each event. Each article was analyzed with special attention paid to changes in arguments, opinions, and messages over time from various political perspectives in Israel. Scholars claimed that Sadat’s famous 1977 visit to Jerusalem was the defining moment in the change of public opinion on peace with Egypt; however, my research shows a gradual shift in public opinion toward peace starting after the 1973 war. These changes in discourse about peace can enhance understanding of the effects of public discourse on foreign policy and peace negotiations in the Middle East; they could also help explain the tremendous difficulty in achieving lasting peace between Israel and her Arab neighbors. Aronoff, Eric and Yael Aronoff. “Bordering on Peace: Spatial Narratives of Border Crossings between Israel, Jordan and Egypt.” In The Design of Frontier Spaces. Control and Ambiguity (ed. Carolyn Loeb and Andreas Luescher; Farnham, UK and Burlington, VT: Ashgate, 2015), 129-55. In this way, like many of the chapters in this volume, our approach extends but also differs from much of the scholarship that makes up the recent resurgence of border studies. As many scholars have pointed out, rising attention across multiple disciplines to issues of globalism and transnationalism, as well as cultural studies approaches to concepts heretofore in the domain of social science, have resulted in increased interest in borders (Newman, 2011). Until relatively recently, borders have been approached within the fields of international relations or geography as static, empirical entities, largely in the context of examining relations between states (Sack, 1986; Taylor, 1994; Shapiro and Alker, 1996). More recent theories emanating from anthropology and cultural studies have emphasized the social construction of boundaries as processes for defining personal, group and national identities, through processes of inclusion and exclusion, defining the “self” and the “Other.” These approaches have broadened the concept of “borders” to include not only the actual borderline between states, but many other kinds of borders. In this conception, borders are everywhere, and the “border narratives” that constitute them are made up of multiple discourses and texts: newspapers, political speeches, posters, poems, plays, novels, everyday speech that give meaning to the border as the “construction of institutionalized forms of ‘we’ and the ‘other’ which are produced and perpetually reproduced in education texts, narratives and discourses” (Newman and Paasi, 1998, p. 196). A History of Conflict Between Israel and Palestine: Can the U.N. Ever Facilitate a Two-State Solution? Click here for a PDF file of the flyer. Aran, Amnon and Rami Ginat. “Revisiting Egyptian Foreign Policy towards Israel under Mubarak: From Cold Peace to Strategic Peace.” Journal of Strategic Studies 37.4 (2014): 556-83. In September of 1978, three nations came together at Camp David to create what ultimately became the first Middle Eastern peace treaty. Through a day-by-day account of the peace talks, Pulitzer Prize-winning author Lawrence Wright looks at how this landmark agreement was reached. Thirteen Days in September: Carter, Begin, and Sadat at Camp David is the untold story of Carter’s push for peace, hard feelings felt by participants, and far-reaching implications of the agreement. By analyzing the actions of President Jimmy Carter, Egyptian President Anwar Sadat, and Israeli Prime Minister Menachem Begin, he offers “hallmark insight” into those tense days. He’ll also analyze the ripple effects created by this tumultuous process. Wright is also the author of Going Clear, The Looming Tower, and a staff writer with The New Yorker. Post-Event Discussion: Following the program, there will be a post-event discussion moderated by Resat Kesaba, Director of UW’s Jackson School of International Studies, as part of Town Hall’s Civic Roundtable Series. Stay for this 9 pm discussion to share thoughts on Wright’s lecture and learn about the Jackson School’s resources for staying up-to-date on current affairs in the Middle East. Presented by: Town Hall, World Affairs Council, and University Book Store, as part of the Civics series. Series supported by The Boeing Company, the RealNetworks Foundation, and the True-Brown Foundation. Series media sponsorship provided by The Stranger and KUOW. Wolf, Albert B. “Peacemaking and Political Survival in Sadat’s Egypt.” Middle East Policy 21.2 (2014): 127-39. By May 1980, the peace process served as the opposition’s focal point for action against the regime. The Lawyers’ Syndicate joined the opposition and helped groups coordinate with one another. By summer 1981, these forces joined the other syndicates in the country to oppose the treaty with Israel. The opposition cited the Knesset’s passage of a law making Jerusalem the indivisible capital of Israel and the Begin government’s attacks on the PLO in Lebanon as evidence that Sadat had abandoned the Palestinians and was helping to promote Israeli aggression. The regime’s continued support for normalizing relations with Israel contributed to the outbreak of the protests known as the Autumn of Fury. By September 1981, nearly 1,500 of Sadat’s critics, including the Coptic pope, the supreme guide of the Muslim Brotherhood, and the brother of the man who would murder Sadat, were arrested. Khalid al-Islambouli and three fellow Islamic fundamentalists assassinated Sadat on October 6, 1981, during a military parade commemorating the October War of 1973. Al-Islambouli later said that he was primarily motivated by the signing of the Camp David accords and the Egypt-Israel treaty of 1979. This piece provides a first cut into the political consequences for non-democratic leaders pursuing cooperation with enduring rivals: they risk their political survival. Autocracies often use foreign antagonisms as a means to legitimate their rule. When longstanding conflicts are resolved, domestic challengers are provided with a focal point for organizing against the regime and presenting themselves as a patriotic alternative to the incumbent. Ensuing protests threaten to unseat the nominal leadership by unleashing a secondary bandwagon of opposition movements, or by promoting a coup or revolution. In Egypt, peacemaking with Israel led to the Autumn of Fury and the assassination of Anwar Sadat. This piece indicates a few additional avenues for future research. To what extent are the paper’s results generalizable beyond the Middle East and the Arab-Israeli dispute? Do the domestic pressures examined here give dictators a bargaining advantage with their rivals (as arguments on hands-tying suggest), or do they make dictators seem unreliable and untrustworthy, especially when bargaining over objects that affect the future balance of power. A third direction to investigate is whether these domestic pressures increase the credibility of secret diplomacy. Dictators who are likely to be punished for pursuing cooperation send a costly signal of their benign intent when they “go private” or pursue secret diplomacy with an enemy. When they talk to an adversary behind closed doors, dictators are putting their domestic political survival in the enemy’s hands. If he chooses to make the content of the negotiations public, it could destroy the dictator’s hold on power. Israeli, Ofer. “The 1973 War: Link to Israeli-Egyptian Peace.” Middle East Policy 20.4 (2013): 88-98. Sadat’s principal goals before the 1973 war included trying to recover the Sinai Peninsula and gaining Washington’s support. Kissinger’s belief prior to the war was that Cairo would finally turn to the United States for help in negotiating a settlement with Jerusalem. Their predictions ultimately proved correct, but at the cost of the October 1973 war. Sadat consciously expected military loses, but the war was fought for a political objective that he shrewdly calculated he would achieve. In the end, Sadat was right and Israel returned to Egypt the territory lost in the 1967 war. The historic significance of the Camp David accords lies in the fact that Egypt, the largest and the most important Arab state, acknowledged Israel’s legitimacy. In February 1980, Egypt and Israel established normal international relations, an event that deepened both regional and international controversy. Zakariah, M. H. “Oil, War and European Initiatives for Peace in the Middle East 1973-74: British Attitude and Perspective.” Middle Eastern Studies 48.4 (2012): 589-611. The Arab-Israeli wars since 1948 resulted in several peace treaties between Israel and its neighbours brokered by the US, the Soviet Union and European countries in an attempt to achieve a just and lasting peace settlement in the Middle East. All efforts however proved ultimately futile, with the resumption of war several years after each peace treaty had been signed. For example, after the Six Day War of 1967, all parties agreed to accept a peace treaty based upon United Nations Resolution 242. However, six years after the tabling of the resolution, war broke out again on October 1973. Another long process of peace settlement ensued which culminated in the Camp David Accords, brokered by President Jimmy Carter. These peace accords, signed between President Anwar Sadat of Egypt and Menachem Begin of Israel on 17 September 1978, led directly to the Israel-Egypt Peace Treaty of 1979. Despite its success, the 1979 treaty yet again failed to achieve the just and lasting peace settlement that had been expected. In all these treaties, the core issues of the conflict, such as the Palestinian refugee problem and the status of East Jerusalem, failed to be resolved. This article examines the British attitude and perspective towards the peace settlement after the 1973 war, focussing on the proposal for an International Peace Guarantee and the initiative of the Euro-Arab Dialogue. Based upon declassified archival records of the Foreign and Commonwealth Office available at the National Archives in England, it unveils the attitude of the British government towards the UN Resolutions as well as its collective initiatives with the European Community to establish a just and lasting peace settlement in the Middle East.